Christmas time, ambulance & intravenous line. Well Christmas Day didn’t quite go as planned. All was well until one of my sons took this bike for a ride and ended up in a ditch. However thanks to the quick thinking of some passing motorists he was placed in the hands of a very professional ambulance team who were assisted by three members of Norfolk Police. I was able to get to the scene very quickly and be with him as he was taken to the Queen Elizabeth hospital in Kings Lynn where the professional care and treatment continued. If it wasn’t for these incredible people who do their jobs with such skill he would have died, of that I’m certain. That’s one of the reasons I wanted to include this in today’s post. You will also notice that there is a third picture in this little collection of images from the 25th December 2015. Whilst not directly connected to my sons incident it does give you an idea of what is faced by those unfortunate enough not to have a free at point of use health care system as we do here in the UK known as the NHS or National Health Service. Now I’m the first to admit that I have been incredibly critical of some of the policy decisions that have been made by the management of the NHS and of the QE Hospital but at no time have I directed any of this criticism toward the actual doctors & nurses & ancillary staff who work far harder and do far more hours than in most other professions. For far less pay as well I might add. The point is that the current UK government seems to be doing everything it can to sell off to the NHS to whoever is the closest personal friend of whoever is in the health secretaries chair at the time, just look what they are doing to the police! So it seems that unless we, the masses who actually genuinely need and support this vital life saving service could find ourselves presented with bills similar to the example shown in the top picture. It’s going to cost lives like my son. Could we get to the stage of an accident happening and the ambulance turning up and saying “Sorry mate, your medical insurance doesn’t cover this” and then leaving? Or being taken to the ER and then “Sorry mate, no coverage, out you go”! Neither is acceptable but there are still places in this so called modern society where that happens and the people are left to fend for themselves unless of course they can afford it. The next point I want to make is this. So many people jump on motorcycles, motor scooters etc wearing nothing more than a helmet (which is the only item of safety equipment that’s actually required by law in the UK) and maybe a tee shirt and shorts, jeans if they are a bit cold and off they go! 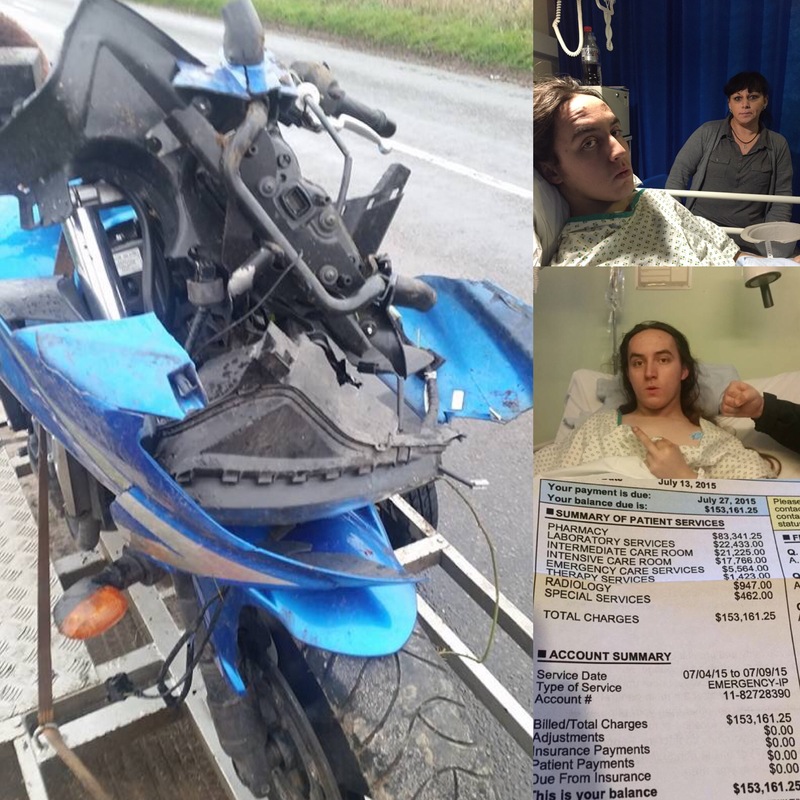 Well my son was thrown from the motorcycle into a ditch and tumbled for over 100 yards and his injuries amounted to three broken ribs and some grazing to his left side. Why? Because he was wearing professional motorcycle gear which included body armour and leather jacket Kevlar jeans and reinforced boots and gloves. Just for a quick spin down the road. Without all that gear, we could have been picking up the bits we could find and then buying a box to put them in! So think! Whatever the weather hot or cold wear the best gear you can get or afford and ride within your limits. Don’t try to be like Valentino “The Doctor” Rossi or you might just need an actual doctor or worse. Enjoy your motorcycle, enjoy the freedom beware of the other idiots who use the roads and beware of the government who might just sell off to the lowest bidding croney the best thing that this country has, it’s health care professionals. 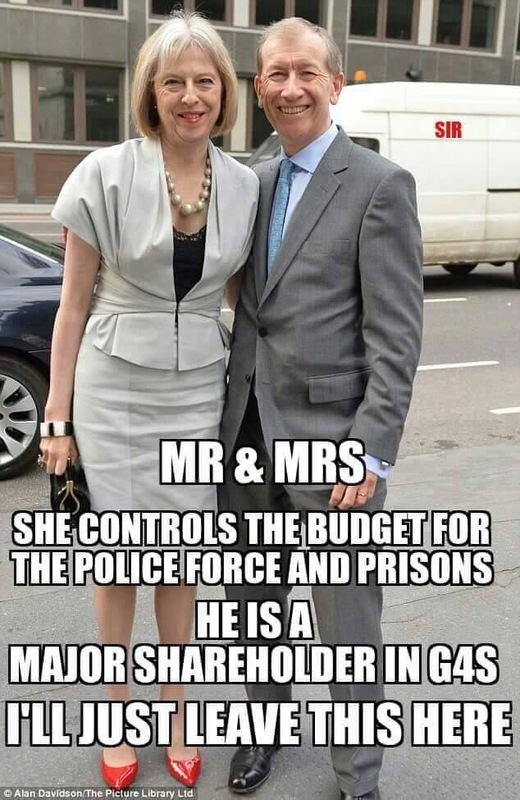 O and let’s not forget that if G4S get their grubby hands on the police….. Well you witnessed what happened at the 2012 Olympics! G4S already has control of the back office in police stations were all the paperwork, prisoner handling and transport is dealt with and they own and run prisons for profit already so it may not be long before the Bobby on the beat is replaced by the community security team who will mace you & then ask you your name after stopping your car for a document check because you are out after curfew! Don’t say it can’t happen here, just check the civil contingency act 2004, that gives the pm the power to do pretty much anything that is deemed necessary including the use of “non governmental organisations” to restore and maintain order. So a double message, fight to keep our world leading health and policing system and keep yourself safe, whatever the weather wear the gear and have some idea.